CLOG FREE, WORRY FREE GUTTERS, GUARANTEED! 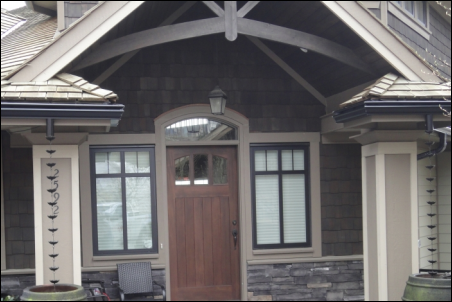 LeafProTM gutters is a division of Tristar Roofing & Gutters which has been serving Vancouver and Lower mainland since 1980. We have over 20,000 satisfied customers. We are a family run business specializing in roofing, gutters, sheet metal and roof cleaning. The nice part about dealing with LeafPro is that we are very versatile and can accomodate any gutter need when preparing a quote. We also install regular gutter sytems for residential and commercial applications. So we have a gutter system for any need! Integrity and honesty is key when making a business deal. We take pride in treating all our customers with respect and feel that treating every customer as it was our own makes for a quality job, everytime! Chris Bralovich - Manager/Co owner of LeafProTM has an extensive back round in gutter installation. He has installed gutters for over 10 years and finally transitioned into a management positon running all gutter operations for the company. Kevin Bralovich - Manager/Sales - Co owner of Tristar Roofing and Gutters has been in and around roofing and gutters since an early age. He manages roofing and gutter jobs on a day to day basis and has extensive knowledge in all fields. Paul Bralovich - Owner - Tristar Roofing started the company in 1980 and has a built up the company to now be one the most respected and go to companies in the Roofing & Gutter industry! Contact Us for a Free Estimate and we will be happy to take care of you!